What to do when you get gloomy about the state of the world? I don't really want to turn this food blog into a political space but for me, reading the news this summer has triggered an emotional rollercoaster of giddy highs and depressive lows, leaving behind a gloom that's proving hard to shake. It's becoming difficult to muster more than a tired sigh every time I read a new headline. What to do? I couldn't exactly head to the arrivals gate at Heathrow airport, but I still went down a British route and buried myself the Great British Bake Off, because, if that tent were a real place I could live, it would be where I choose to spend the next three months, wrapped in a cozy blanket of meringue, butter, and bad puns. Unfortunately, I blew through all 6 seasons in an astonishingly short time, so instead of cuddling up with Paul and Mary and oregaaahno and pidda breads, I have to use other sources of comfort. There really is only so much rose a person can drink by herself and not cause another set of problems entirely, so I turned instead to another thing that always cheers me up, colorful food! It never fails to make me happy, and so I built myself a giant salad mountain of strawberries and watermelon and put some burrata on it because emotional distress is never not helped by a too-large serving of dairy, amirite? This salad is super easy to throw together, full of juicy, ripe summer fruit (seriously, this is a juicy salad), topped with delicious things like basil and pine nuts, and most importantly, vibrant enough to shine a little sun on a dark mood. I'll take seconds, please. In a large bowl, whisk together olive oil, vinegar, pepper and salt to taste. 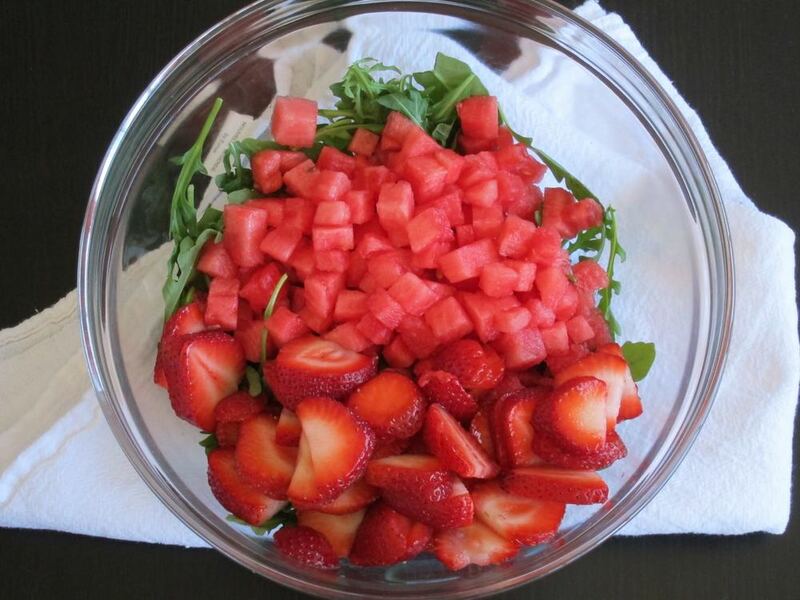 Add the arugula, 2 cups of the strawberries, and 2 cups watermelon, and toss to coat. Divide desired amount of salad mixture among serving bowls and top with remaining strawberries and watermelon. Top each bowl with a portion of burrata, sprinkle with the pine nuts and basil, then drizzle with more dressing and garnish with flaky sea salt and more fresh ground pepper. Toast the baguette slices and serve.